“Let me lay to rest the bugaboo of what is called devaluation,” Richard Nixon told his fellow Americans on Aug. 15, 1971. The 37th president had just announced the U.S. would “temporarily” close the gold window — ending the convertibility of dollars into gold that had been key to the postwar Bretton Woods system. What didn’t change in 1971, though, was every bit as important as what did. Because the dollar remained the world’s reserve currency — a “privilege” that, four decades on, looks increasingly like a curse. When he made his address, Nixon was keen to allay fears he was undermining the dollar’s value by cutting the link to gold — especially given the apocalyptic warnings (both in the press and inside the White House) of how disastrous such a move would be. Any astute viewer that day would have found it eerily reminiscent of British prime minister Harold Wilson’s “Pound in your Pocket” speech four years earlier. Nothing would change besides the entire monetary structure. And now, back to your scheduled programming with Bonanza. It’s now been over 40 years since the “temporary” suspension of dollar convertibility. Has the dollar been “stabilized”? Clearly not. But what’s worth noting is how much faster the dollar’s domestic purchasing power has fallen in the last four decades — freed from gold — than it did in the 40 years before Nixon’s announcement. Between August 1931 and August 1971, the consumer price index — as measured by the Bureau of Labor Statistics — went up by 170%. Since 1971, the CPI has risen 453%. Of course, Nixon tried to spin his economic reforms — the gold window closure was accompanied by a wage and price freeze and a 10% import tariff — as necessary for “building the new prosperity.” The logic was clear. A devalued dollar, aided by the import tax, would increase America’s international competitiveness, while wage and price controls would prevent these policies feeding through into higher inflation. At least that was the plan. As we know, it didn’t turn out too well on the inflation front. But higher rates of inflation aren’t the only phenomenon we’ve seen since the early 1970s. The irony is Nixon hoped to solve another problem by closing the gold window — the U.S. trade deficit. “The United States has always been, and will continue to be, a forward-looking and trustworthy trading partner,” he reassured the world on that fateful August evening. Within a minute, Tricky Dicky announced the 10% tax on imports. The United States has not run a trade surplus since 1974. It has consistently imported more goods and services than it has exported. Most countries cannot do this for long. They need the revenues from exports to pay for imports. The U.S. is different because it issues the world’s only reserve currency, which is used to settle most international trade. France’s finance minister under president Charles de Gaulle, Valery Giscard d’Estaing, described this in the mid-1960s as America’s “exorbitant privilege” — the ability of the U.S. to fund its trade gap by the creation of new dollars, in which its imports are still denominated. With gold convertible for dollar bills, this “privilege” risked emptying the United States’ huge stockpile of monetary metal. But freed from that gold obligation in 1971, isn’t the privilege actually still a curse today? The U.S. was in a tricky position throughout the Bretton Woods era. Its problem was summed up by what became known as the Triffin dilemma, after Belgian economist Robert Triffin. Because as the global economy expanded, he explained, more and more dollar liquidity was needed to oil the wheels of international trade. And the U.S. was the sole issuer of dollars. So the only way the rest of the world could obtain dollars was by exporting more to America than it imported — all but ensuring the U.S. would run a trade deficit. Of course, the U.S. could seek to match its exports to its imports — but that risked a seize-up of global trade if foreigners could not get hold of sufficient dollars to settle their trading with non-U.S. parties. That was one part of the Triffin dilemma. The other concerned the link to gold, fixed at $35 an ounce. As more and more dollars entered the system, the ratio of dollars to gold increased, putting upward pressure on the dollar gold price. The London Gold Pool — whereby central banks clubbed together to keep gold prices down by coordinated gold sales — was set up in 1961 to address this problem. However, the system fell apart after France pulled out — de Gaulle preferring to swap his dollars for gold, rather than vice versa. 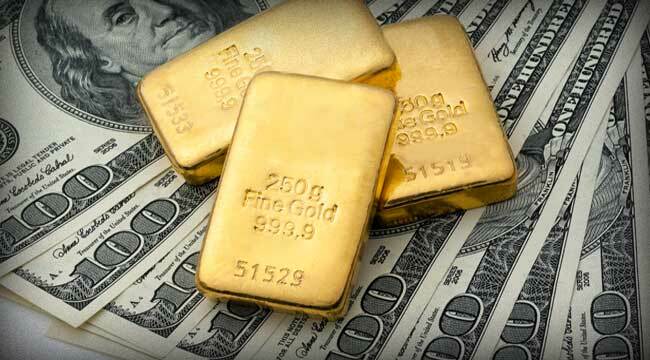 The open-market gold price rose, accelerating the drain on U.S. gold reserves, as arbitrageurs realized they could swap $35 for an ounce of U.S. government gold and sell it for more elsewhere. The fixed-exchange regime of Bretton Woods, resting as it did on a $35-an-ounce gold price, was unsustainable in a world of ever-increasing dollar liquidity. Nixon had three choices — close the gold window, risk setting off a global deflationary spiral, or give away the United States’ remaining stockpile of metal. He closed the window. The dollar, however, remained the world’s reserve currency. This meant the U.S. was now in a position — both at home and abroad — to really go to town exploiting d’Estaing’s exorbitant privilege. And looking back over the last 40 years, it looks like that’s exactly what successive administrations did. By doing so, he pushed the world into a whole new monetary system, one whose ultimate backing is the “full faith and credit” of the United States government — and nothing more. It’s a worrying irony that a system resting on such “faith and credit” was midwifed by the man responsible for Watergate.